Քամյուն Աբսուրդի գիտակցման մեջ մեծ ներդրում է բերում՝ միշտ հերքելով նրանում նիհիլիզմի դերը:. Լիրիկական և քնարական էսսեներ (1970) – L'envers et l'endroit, Noces and L'Eté. ↑ 13,0 13,1 13,2 Todd O. Albert Camus. Une vie — Éditions Gallimard, 1996. ↑ 36,0 36,1 Le mythe décisif. ↑ "Camus". Random House Webster's Unabridged Dictionary. ↑ David Simpson writes that Camus affirmed "a defiantly atheistic creed." Albert Camus (1913–1960), The Internet Encyclopedia of Philosophy, 2006. Retrieved 14 June 2007. ↑ See the book The Biography of Europe by Pan Drakopoulos. 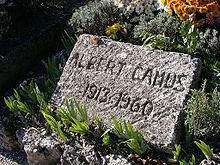 ↑ Willsher, Kim, "Albert Camus might have been killed by the KGB for criticising the Soviet Union, claims newspaper", The Observer, 7 August 2011. ↑ The Prime of Life (fr), by Simone de Beauvoir. ↑ James Campbell, "Betwixt and Between" (review), Wall Street Journal, 3 May 2013. ↑ The Human Crisis - Albert Camus Lecture at scribd.com.